I am constantly amazed at all of the wonderful opportunities social media can bring to teachers and students when used efficiently and correctly. 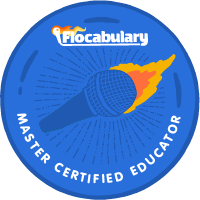 When others ask me why I am so involved in the educational world of social media, I tell them that it is my way of connecting with classrooms and educators from around the globe. Social Media--Periscope and Twitter specifically-offers educators the opportunity to create their own "personalized" professional development. Are you interested in learning about Genius Hour or maybe altering the way you are incorporating it in the classroom? Maybe you are getting ready to start a unit on the Great Depression and you are looking for lesson ideas. Perhaps you have iPads in the classroom but are not using them to their fullest potential and are wanting help! Periscope(and Twitter) can help you answer all of those questions and much, much more. Here is a quick video that my district helped me put together to talk about how teachers can use Periscope. Click the video or here. Periscope is pretty easy to use, but it does take a little getting use to. Basically, Periscope is a live broadcasted video where others can tune in and watch your video as well as interact with you through comments in the comments box. Miss a live video? No worries--you can catch it on replay later. Periscope will hold your video for 24 hours and then it disappears from the site. However, you can save your videos to other websites such as Katch.me so that way your views are always able to catch your scope replays. Here is a great website that breaks down the basics of Periscope. Before you flip the camera and start doing videos with yourself....ease into the app by tuning in to others' scopes. Here are some of my favorite Periscopers that I love to watch each week. I cannot say enough amazing things about Jen Jones. 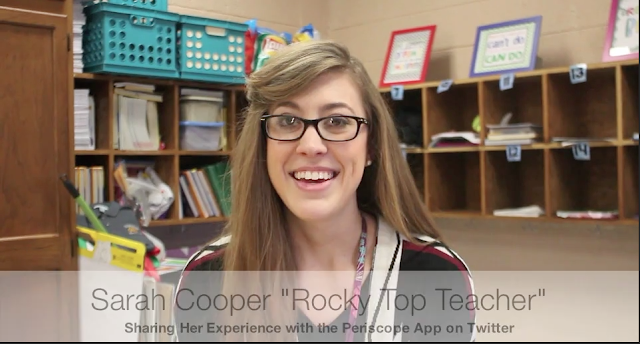 She is fabulous and does a great job of bring literacy tips to teachers through Periscope. If my phone sends me a notification that Jen is on the air, I stop everything I am doing and tune in because I know it is going to be phenomenal. Kami Butterfield is a technology GENUIS! 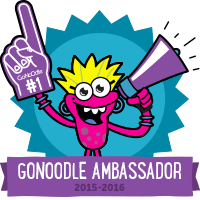 The way that she uses iPads, apps, and everyday resources in her classroom is THE BEST! She inspires me to do a better job of using resources and technology with my students. She is a must watch. Tony Vincent is another technology guru. He is also very present on Twitter (which is secretly my favorite social media platform). You do NOT want to miss his scopes or Twitter posts! Angie Olson is a teaching gem. She is a second grade teacher whose scopes are THE BEST! Angie is a blogger over at Lucky Little Learners, and I promise you that the tidbits she shares on her scopes are GOLD! Are you on Periscope? 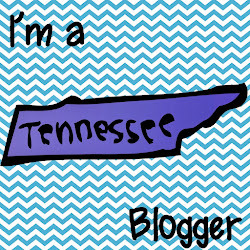 My handle is @rockytopteacher and I hope to see you on there soon! As always, feel free to email, arockytopteacher@gmail.com, me if you have questions about Periscope, Twitter, or anything in between. I am here to help you! This is a great post! I will be sending teacher to this post to help them better understand Periscope and why they should be using it!! Thank you for sharing and inspiring! I want teachers at my school to get on board and I will also send them to your post and ask them to watch that video!